Market Rasen Under 15s earned a fine point against Alford Town at Rase Park on Sunday. 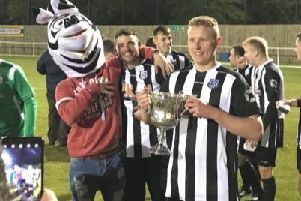 Comprehensively beaten twice by Alford last season as the Town juniors narrowly missed out on promotion, Rasen were expecting a difficult game. The first half was a tight affair with both teams playing good attacking football. Unlike previous games, Rasen were strong and resolute early on and received their reward for some great counter-attacking play with a well-taken goal by Ethan Janes. But a well-worked cross from Alford saw them equalise just before half time. Going into the second half locked at 1-1, Alford came out and hit Rasen early on the break to take a 2-1 lead. Rasen were then reduced to 10 men when their keeper Max Casson was shown a red card for a foul which most felt merited no more than a yellow card and resulted in a penalty kick. Man-of-the-match Ryan Kenyon stepped in and saved the spot kick to keep Rasen in the game and give the home side renewed heart. Despite playing with a man short, Rasen dominated most of the second half with a great defensive and counter-attacking display. And with only minutes to go, Adam Richards was fouled by the Alford keeper, resulting in another penalty and a second dismissal. Janes stepped up and calmly slotted the spot kick home to give him his second goal and Rasen the point they thoroughly deserved. Rasen hit the road on Sunday to play Ruskington Yellows.